Mardi Gras has found its way to us. Once again people will fill Bourbon Street in New Orleans for the annual revelry that manages the impressive feat of eclipsing every other celebration in a city that is famous for its celebrations. One of the most iconic drinks consumed in New Orleans has to be from the famous Pat O’Brien’s: The Hurricane. 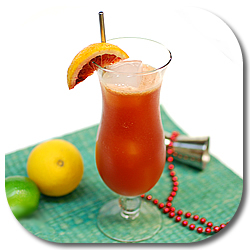 Served in its synonymous glass and filled with juice and rum, this drink is the perfect way to start a party. Shake with ice and strain into a hurricane glass (or in its absence a pint glass will do) filled half-way with ice. Garnish with orange slices and a cherry with stem. The world-famous Patty-O’s Hurricane is a thing of legend. Sadly that legend has become somewhat tarnished in the modern day. As with much of Bourbon Street’s libations, the Hurricane has degraded over time to help keep costs at a ridiculous low while serving the customer less and less of what made the drink great. Today you can buy Pat O’Brien’s Hurricane Mix in packets, mix with a little rum, and supposedly have an authentic Hurricane. I would stipulate, however, that you can’t even have an authentic Hurricane at the place of it’s inception anymore. The original Hurricane was concocted by Pat O’Brien (go figure) in the 1940’s. The failed social experiment of Prohibition had left the US with a dearth of whiskey. Of course, since rum had been produced just off of the coast of the US, there was plenty of that to be had, and generally if you wanted to buy a bottle of whiskey for your bar, you had to buy a case of rum as well (which should just be every bar’s policy anyway). Needing to find a way to deal with this glut of rum in an admittedly whiskey and cognac town, Pat O’Brien came up with a drink that used a full FOUR OUNCES of booze. Some passion fruit syrup and some lemon juice round out the drink nicely, and we have (who else?) Jeff “Beachbum” Berry to thank for rooting through the Dustbin of History to find the original recipe. Jeff recommends Gosling’s Black Seal rum for the Hurricane, but personally I prefer using Coruba by a factor of about a billion point seven. Of course, as the drink has become corrupted over the years, the variations of the recipe have multiplied like rabbits set loose in a Viagra factory. From mixtures using powders to mixes of rum and Hawaiian punch, the bad recipes are too many to count. The GOOD recipes are almost as varied – from Dale DeGroff’s recipe that calls for Galliano to be added to the mix to the (rather delicious) recipe that Chuck Taggart posted a number of years ago, pulled from the Times-Picayune. It’s a bit sad to think that millions of happy tourists will be stumbling about in the French Quarter with curvaceous glasses of very little rum and a lot of powdered sweetener when the original drink is so much better and really so incredibly easy to make. If you really want to capture the feel of Mardi Gras at home (and you don’t live in New Orleans), be sure to make one of these. It’s nice to see the original Hurricane recipe being spread. I’ll tweet this post for good measure. I’ve been making this recipe for a while, and recently served it to a gang of rabid Super Bowl fans. I use Finest Call Passion Fruit puree (per the Bum) and some of my tasters found the drink a little tart. Personally, I like the tartness. Matt, it may just be the lighting, but I see your hurricane is a bit more orange in appearance than mine, being more toward brown in the color spectrum. I wonder if a passion fruit syrup, like Monin, might sweaten it up a bit. Does anyone have a preference for syrup brand? A good sazerac is pretty hard to beat. But a close second is a properly made mint julep. Though I have never found the product of Emeril’s food recipes to be very palatable, his recipe for juleps works every time. make the mint simple syrup (you know how). Remove from the heat, cover and steep for 30 minutes. Strain the mint syrup of the leaves and let cool. Combine the cooled mint syrup with the bourbon and pour into a sterilized bottle. A few mason jars works well. Put it in your fridge and give it a month, if you can. Serve over crushed ice with mint sprigs. Good to see this up here since I just had one of these modern Pat O’Brien’s concoctions on Lundi Gras. I did have a really nice Ramos Gin Fizz at the Palace Cafe on Sunday. What kind of passion fruit syrup is the Dood using these days? Last year in Nola me and Tiare just had to try Pat O´Brians hurricane. We knew it was going to be bad, but we had to do it. Turns out that it was much worse than we thought. I bought a bag of the powdered stuff for a prank, but never had the balls to mix it and serve to another human being. It´s incredible how people manage to mess up such a simple and tasty drink. 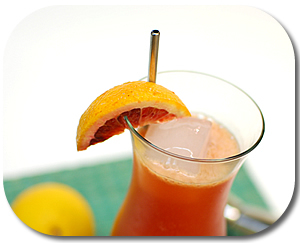 The lemon in the picture almost looks like a blood orange, something I want to try in the future too. I finally found a source of passion fruit syrup where shipping won’t kill me, so I am looking forward to concocting my first Hurricane this weekend. My rum supply is very limited, so it looks like I’ll be going with either Gosling’s Black Seal, or maybe Appleton V/X. Does anyone have a preferred rum for their Hurricanes? I love rum drinks, but often have trouble finding the right rum(s) that would take the drinks to the next level. I see some people are making passion fruit syrup from Looza Passion Fruit Juice. Can anyone speak to this recipe versus another or commerical available PF syrup? I had to do some searching for passion fruit syrups as well. Marleigh from Sloshed! recommends the Monin Passion Fruit Syrup. Craig from ColonelTiki.com recommends Marquisa (http://bit.ly/9hvF9m). I think I may spend some time this weekend making my own, cause why not? Auntie Lilikoi makes the best Passion fruit syrup in this hemisphere, and shipping isnt too terrible, but its fresh. I was always under the impression that for a Hurricane, you should use a dark rum that you can’t see through. I made my first Hurricane over the weekend, using Cruzan Blackstrap. It was either that or Gosling’s Black Seal, and I had more Blackstrap so I went with it. Ta da! I really enjoyed it, although it was a little too sour for my wife’s liking. The Vieux Carre is my favorite NoLa drink at the moment (on the rocks), Aside from a nice strong Hurricane, I only get VC’s out, as my bar lacks a few of the pieces, and you need to get it at a proper bar as it’s a grown up drink. The stuff in the packet is useful for one thing, and one thing only. Tailgates. You can get packets, and mix up a half gallon and bring a handle of Cruzan and you are good to go, a civilized drink (to whatever extent you can have one in a parking lot) I go stronger on the water then they call for and usually go with 3oz of rum. Trader Vic Dark rum is a nice cheap uber dark sweet rum that works well for Hurricanes, when I make Hurricane Punch at home, I use that Monin and Lemon, works well and is tasty, it is a kind of scary brown though more then red or yellow. Thanks for the inspiration, Matt. We’re having one right now, post- Hurricane. Love the lilikoi! Bottoms up! BG Reynolds makes a nice Passion Fruit Syrup for this do they not? I love a hurricane, but I think my favorite Dixie Tiki Creation was the Rum Runner. I like to use the BG Reynold’s Syrup for my Hurricanes. It’s delightfully tart. I believe the ORIGINAL passion fruit syrup used here was Jero’s. Anyone know the whereaabouts of Jero’s Passion Fruit Syrup, please let me know.